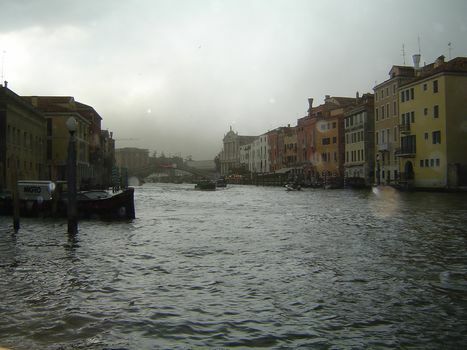 In the year 1494, even an astute visitor might have failed to see that imperial Venice was entering a slow but terminal decline. That was the year a French diplomat arrived on business. 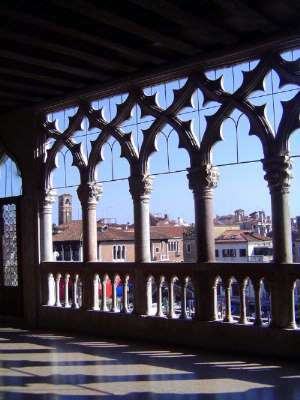 His name was Philippe de Commines, and in his memoirs he describes his surprise at "so many church towers and monasteries, and such large buildings, and all in the water...." He describes the city's 30,000 gondolas as "neat little barges covered with tapestry and with beautiful thick carpets to sit on." 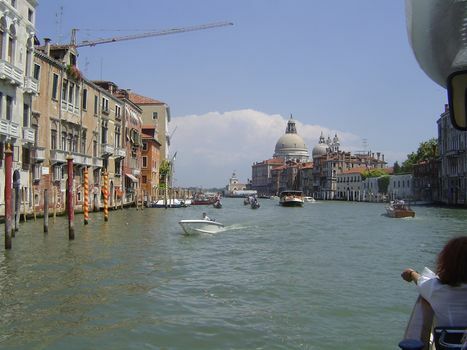 Coming to the Grand Canal, he says, "I have seen ships weighing four hundred tons and more near the houses here." De Commines then offers one of the very few esthetic judgments in his lengthy book: "I believe that it is the most beautiful street in the whole world." All things considered, it probably still is. One thing's for sure: motor boats, crane jib, and all, you'd have a hard time finding any other main street that over the last 500 years has changed as little as this one. 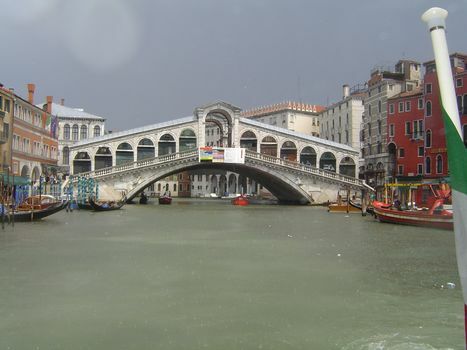 Midway along its two-mile-length is the Ponte di Rialto, the "Deep River Bridge." 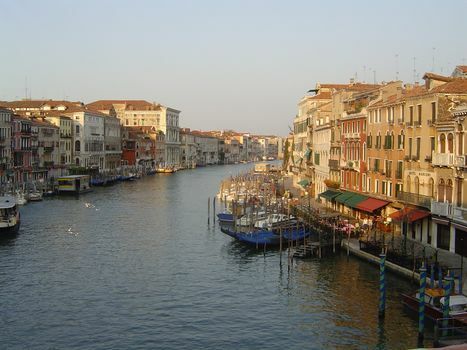 The canal, about 15 feet deep, is only deep in comparison to the city's smaller canals. A more important distinction is in the matter of breadth. 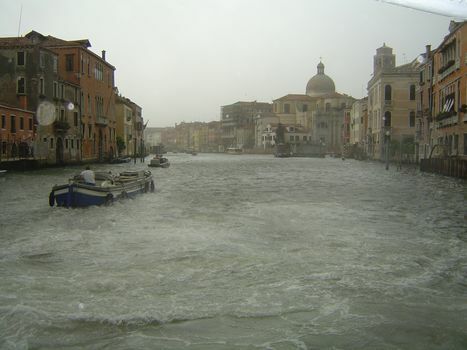 The small canals were easy to bridge; the Grand Canal wasn't. Today, there are three bridges across it, but until 1854 there was only one: this one, the fifth on the site and the first of stone. It was completed in 1590, a century after de Commines' visit. 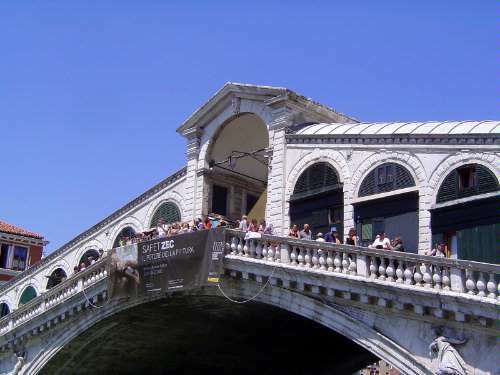 Like Florence's old bridge across the Arno, this one is lined with shop space rented out since 1591. Steps obscure the arch below. On either side of the shops, there are wide sidewalks. 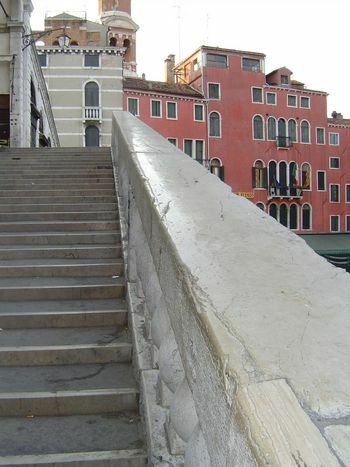 Four hundred years of hands sliding and slapping have brought the stone railings to a high sheen. The hotel behind, unified by color, consists of three 17th-century houses. 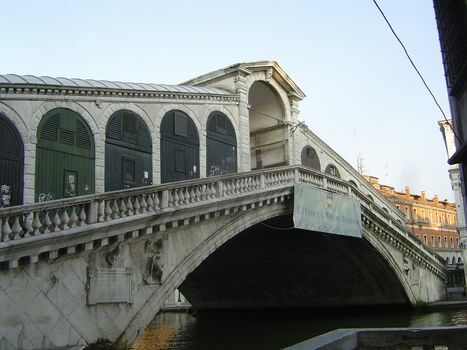 Just west of the bridge, the Rialto district was the commercial center of the city before the shift to St. Mark's. 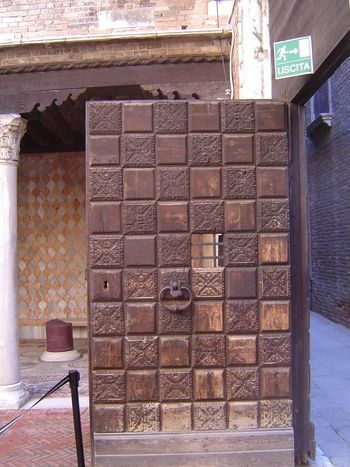 It was here that the Banco Giro opened in the 12th century and came to dominate international finance. The market burned in 1514. 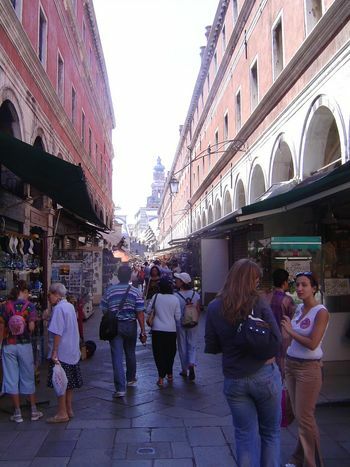 Two arcaded markets were built to replace it: first, in 1522, the Fabbriche Vecchie di Rialto, here on the right; then, about 40 years later, the Fabbriche Nuove, completed to a design by Jacopo Sansovino, the architect of the Libreria Sansoviniana at St. Mark's. From either side of the bridge, the canal gently curves away. This view looks south. 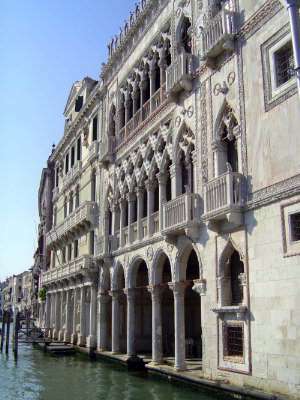 On the left, after a succession of smaller buildings a pinkish facade marks the Palazzo Corner Loredan, whose two original floors date from the 12th or 13th century, when the family lived above their warehouse. The upper two floors are from the 16th century. Four more palazzi along is the huge Palazzo Grimani, built about 1550 by a procurator. Hail in a brief summer storm. It was over in half an hour, but it was dramatic while it lasted. Hail splashes in the foreground. 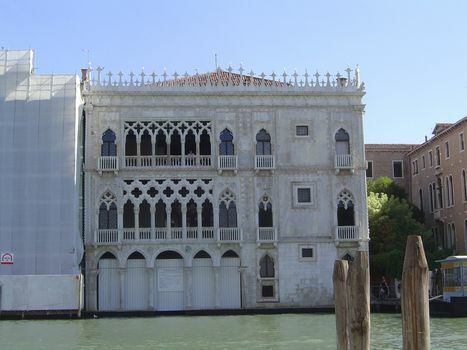 This is probably the most famous of the houses along the Grand Canal: it's the Ca' D'oro, or "house of gold," finished in 1440 by Matteo Raverti for Marino Contarini. A left wing may have been planned but was never built. Once bright with white, black, blue, and gold paint, the Ca' D'oro's brilliance is now subdued. 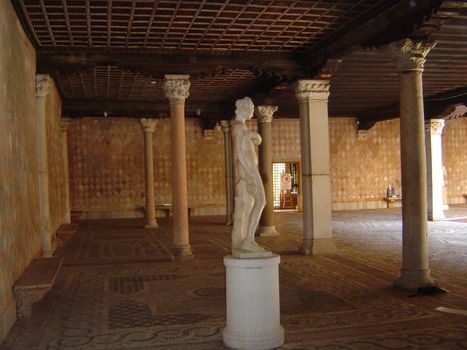 Reminiscent of the Doge's Palace? 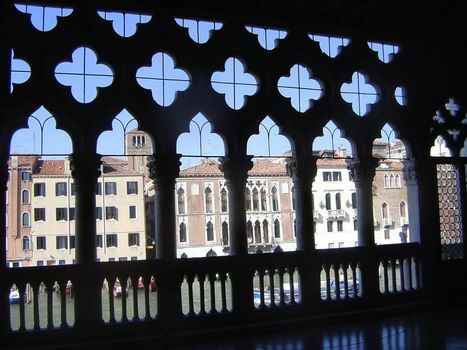 You bet: Ruskin goes so far as to say that "every Gothic building in Venice which resembles the latter [the Doge's Palace] is a copy of it." 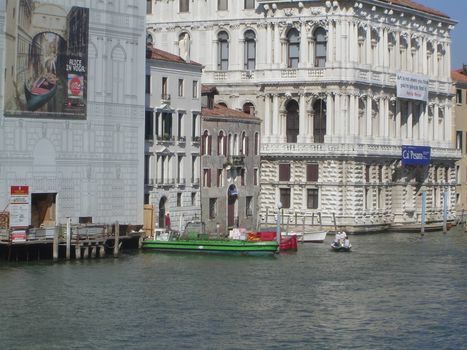 The building under wraps is the Palazzo Miani Coletti Giusti, 1766; that on the right, the Palazzo Giustinian Pesaro, from about 1450. A more orthogonal view of the building with triple-stacked arcade, quatrefoil roundels, and alternating marble and limestone. The land entrance to the Ca' D'oro. 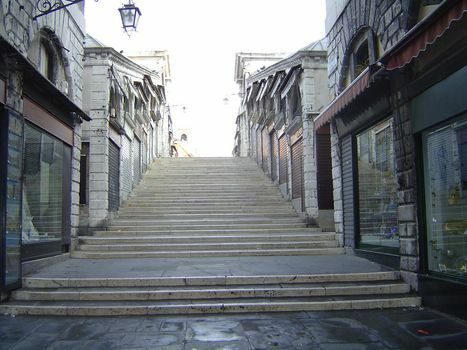 The floorplan is a "U," with the gate opening onto a street that runs perpendicular to the Grand Canal. The well-head, by Bartolomeo Bon, allegorically depicts the virtues of strength, justice, and charity. Detail of the door to the house, now a museum. 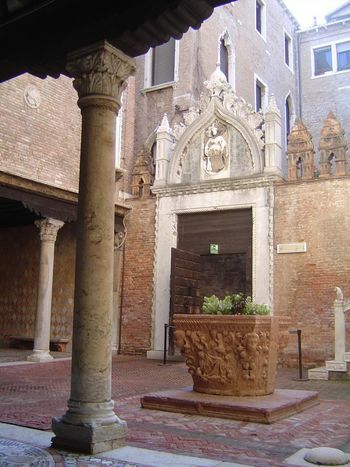 The ground level, with the courtyard in the sun; above is the piano nobile. 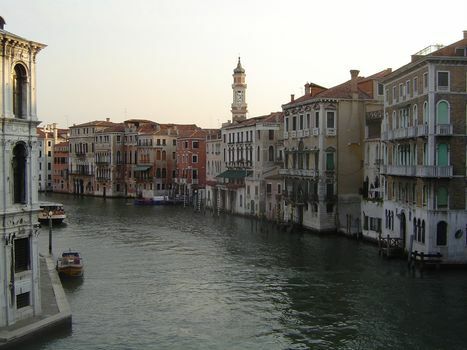 Canal view from the piano nobile . Looking from the piano nobile through the arcade to the canal and, across it, the Palazzo Brandolin--a neighbor, so to speak. 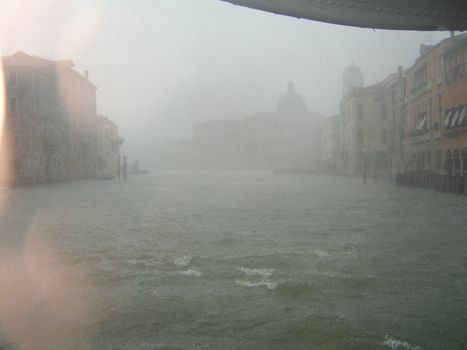 We're looking north from the arcade to the opposing Ca' Pesaro, which is Venice's museum of modern art. 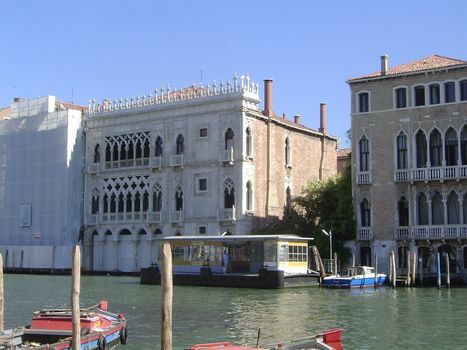 Leonardo Pesaro was a procurator of St. Marks who hired the architect Longhena to design something suitably ostentatious: both he and Longhena died in 1682,about 30 years before the building's completion. The building under wraps is the Palazzo Corner della Regina.